“This project has evolved so much, I wanted to do separated pictures of portraits and faces with water colours, because it is what I had been doing, and wanted to continue that. With the other Masters students I saw what they were doing, and I though then that I could try something else! Something more related to illustration, spinning a story etc. So at the beginning I was taking stories from other books and fairy tales. I felt like there was still something missing, I thought to make the story by myself. The final story is so different to how it was in the beginning. It was so fun to make the characters, to see how they evolved. The main character is an Axolotl. I based the cave in the book on a cave I found in Catalonia, my home. I went there to sketch it. “I’m from Los Angeles – a while back I was visiting Bournemouth on holiday and I loved it here. MA Illustration has been very open ended and as a result I have ended up pursuing things I don’t think I ever would have before. My final project is 2 pronged. My background is in sculpting, but on this course I have been working with digital. The crux of my masters work was exploring different digital artworks and how they can be applied to Illustration. The digital rendering technology I used in this project is mostly used by people in the movie and games industry. I wanted to use the same technology in a manner thats closer to Fine Art. As a hand sculpter I was always very gestural – I like to show the process behind my work. I wanted to find a way of incorporating that aesthetic into the digital art. I came up with a way of showing the model with vectors and layers – exposing parts of the building blocks of the piece. Artists like Rodin leave their mould marks – I wanted to do that in a digital way. I used a technique called data bending. I took a picture of myself in my room with a Joy Division shirt and guitar. I manipulated it using audacity – a sound editing programme. I added reverb and echo. I was doing musical covers of musicians I liked, so I wanted a piece of me hidden in there. You can actually play the file – I mean it sounds weird, but it does work! The result is these Vinyl covers. The second part of my project – I used 3D Printing to illustrate childrens books for the blind. I 3D printed characters from the tortoise and the hare. For the show I will have a scene with simple trail that is tactile. I want to develop a way it can be distributed cheaply and easily – so you could download your own story. Our newest graduation animations are now being entered into festivals across the globe – so for now, here’s a little compilation of the animations of 2014. Why do Carols neighbours find her so unsettling? Erika, a teenager with Aspergers, decides to try and reunite her strange, elderly neighbour Carol with her alienated son. In doing so Erika discovers the key to Carol’s hidden past – the reason why the neighbours find her so unsettling. "The team constructed a 74ft trench above the ground in Salisbury..."
Watch an exclusive ‘making of’ 2014 Graduate film ‘Wait for Me‘, including the team constructing a 74ft trench above the ground in Salisbury. Synopsis: Arthur and Annie Graham say farewell to their son William, as he departs for war, in the winter of 1914. Drifting further and further apart, the couple try to cope with their son’s absence. ‘Wait For Me’ has been written to coincide with the 100th anniversary of the First World War this year. As proud members of the Imperial War Museum’s First World War Centenary Partnership, the crew aim to celebrate the centenary by commemorating the sacrifices made by so many one hundred years ago. Alice is a hair and make-up artist who has worked closely with wigs and hair sculptures. She enjoys the process of styling a wig having worked with natural hair, synthetic hair, and wool – working innovation into traditional techniques such as knotting. She has created a range of work including a Marie Antoinette 18th century Wig, 3D Sculpture Neon Wig and Wool creations. Emma believes research is the key to creating a unique and original design and focuses extensively on this throughout her work. She has trained in all aspects of make-up artistry including designing and creating – with skills in wig making, sculpting, mould-making and prosthetic paintwork and application. Jenna specialises in special effects make-up creation and make-up for film. The atmosphere and exhilaration of working with like – minded creative individuals on projects drivers her enthusiasm for working within the film industry. At AUB Jenna progressed to head make up artist on many graduate films and organised a large team for the collaborative production of Grimm Tales. "Since year one my work has changed so much. I never thought that I was going to do a moving image." The whole project was exploring the idea of existence, vulnerability and what’s out there. It’s very existential and morphed throughout the project. The idea of the feathers is very innocent, it’s almost like rebirth. As the feathers fall down and they adhere to the bodies almost like a totem. When that’s done it reverses and the feathers go back up, it’s like being reborn again. I always knew I was going to do a projection, I wasn’t even sure if I was going to do video work. I was leaning toward prints and then I thought that video work would work really well with what I was trying to do. I was thinking of just projecting it onto a board but I wanted it to be tactile and really ephemeral, so its supposed to be so people can walk around it, feel it as the chiffon moves. It’s very raw, that adds to the vulnerability of it all. I think [AUB] is such a great creative environment. It’s so supportive of the artists and really, really helps you build the artwork; it’s how I’ve managed to create work that I am happy with. They’ve really given me the freedom and good feedback in order to build on it. The facilities are great, it’s been a real privilege. "I’ve been to their storerooms and stockrooms and photographed the sculptural and anthropomorphic qualities of objects that we wouldn’t even be interested in." My work is called ‘Stock’, it’s basically looking at the behind the scenes of a working shop. I’ve been to their storerooms and stockrooms and photographed the sculptural and anthropomorphic qualities of objects that we wouldn’t even be interested in, I’m trying to create interest from these objects. I work in a sandwich shop and it started of there with a tiny little stockroom that we had. It went on to small business stockrooms, like pet shops and vintage yards – all different places. I’m really interested in sculptural qualities of objects. You can see that in some of the work. AUB has been absolutely brilliant. The tutors as well they’re just so helpful! Its just been fantastic there. "I wanted people to stand here and not really get it and ask, 'What’s going on?'" “My work combines painting and photography together, it all stemmed from my dissertation where I wrote about the Pre-Raphaelites and the invention of photography. When photography was first invented, in portraiture they didn’t really know what to do and didn’t know how to pose people. So, they would copy Pre-Raphaelite paintings, all the poses. Since then painting and photography have had a really close relationship. It’s something that I think is coming even more abridged now. In all of my portraits, they are actually a series of eight, I take gestures from paintings, which are mostly from the renaissance and work them into a contemporary photograph. This is to confuse the viewer, because we have a really odd relationship you look at it and you think it’s absurd, ridiculous almost. When you see it as the sculpture from that time, you think it’s beautiful, you don’t question why they’re stood like that and obviously we do now, so it’s to sort of question the viewer’s understanding of not only the history of art and painting back then, but what we consider a photograph and a portrait now. [On BA (Hons) Photography] we’re constantly pushing the boundaries, it’s not just this is a pretty image, it’s no, we want to question stuff, we want to really challenge how viewers perceive photography. I’m sure you can tell as a whole course, everything is so different. Mariya is using paint beyond its image making qualities, she is curious about its physicality and the transformation from liquid to something fixed. Rather then adding or taking away from the support in a conventional manner her process consist of pouring substance over and then separating it from the surface of the support. Mariya’s practice has developed out of practical and theoretical concerns with paint and explores the intersection between painting and sculpture, questioning the role of the support and the relationship of the painting to the wall, where the painted element is no longer attached to or dependent upon the support. “I’ve always had a passion for film and television and I’ve worked with these guys before on previous projects, so I worked on three grad films. You start with the usual meetings and discussing things. My role is usually a supervisor and I’m more of the organisational side, so I manage the budget and things. I talk a lot with the director about the style and things they want to gain from the film. From there, the costume department go off and do the sourcing and the making and pulling it all together. Throughout the course of the weeks leading up to the shoot you have to fit the actors, you have to keep in contact with them and make sure the director is happy with the look and the style. On set the work is manually dressing and continuity and making sure looks great for the film. There’s quite a lot of time constraints you have to think about it and budgeting which is a big deal. We fundraise like crazy! It is challenging in that sense, but so rewarding at the same time because in the end you have a production with enormous collaboration between so many courses and people that pull together. At the end of the day, I get something like this [screening at the BFI] out of it, which is unforgettable. “We’ve made a comedy about not growing up or about there not being such thing as an adult, so you don’t have to act your age, you don’t have to be mature if you don’t feel like it. It’s gone down really well. Today’s been the first day I’ve seen it with an audience and it’s so satisfying to see everyone laughing. For a while, we didn’t know if what we thought was going to be funny was funny. You go through phases with it where you think that no-one’s going to enjoy it and things like that. Lewis is a multi-disciplinary designer with a keen interest in exploring the intersection of music, architecture and philosophy. Memory Palace is informed by the writings of Plato, Aristotle, Jedlowski, Lefebvre, Sacks and Cage, and seeks demonstrate the potential that a palimpsest approach holds in an urban context. Through exploration and re-interpretation of writings pertaining tomemory, both in an architectural and personal context, Memory Palace aims toexplore the power that the vestiges of the past hold to inform the developments of the present. Site-specific sound experiments have formed a key component of Lewis’ architectural development, and the relationship between sound and space – and the effect of the former on the perception of latter – is further explored through a piece of music that seeks to evoke the ambience of the differentspaces within his proposal, and the experiential transition between them. “The chosen route for the hybrid building in Poole was to create a large scale, bakery with hotel; a place to live, eat, work and learn. The baking aspect was important at the beginning as it was specifically chosen to link the project with the research by design unit, “Cake and Architecture; A Concrete Conoisseur”. Final model for Comprehensive Design Projecy; a large scale bakery and hotel on Poole quay. “My architectural education has developed a particular passion for organic architecture. This interest was significantly highlighted within the Research by Design project undertaken at the beginning of third year where I conducted an investigation into the many different interpretations of organic architecture as demonstrated by some renowned architects such as Frank Lloyd Wright and Oscar Niemeyer. As part of this I researched and discussed how architecture is inspired by nature through forms, scales, patterns and technology. “Paper is a valuable resource. I felt inspired by paper; the versatile qualities and the openness of it as a material. However, more than 17.5 billion pieces of Junk Mail is produced yearly. The “Pulp: Make: Use” awareness campaign informs and persuades people to recycle and upcycle. The message is delivered in an integrated campaign utilising a book publication, posters and signature objects created using junk mail. There were facts and processes I learnt along the way during this project, and has made me realise just how much paper is all around us and how much we waste! “My project was inspired from the Archbishop of Canterbury’s quote about how fashion has devalued the cross. I wanted to explore weather the meaning of the cross had been lost in a fashion statement, so I gathered research from both perspectives and found a clear contrast between how people viewed the cross, which enabled me to be very experimental with my project. My final pieces were visual metaphors aiming to shock viewers and encourage them to think from a different perspective. I created an empty bible, to metaphorically show how something so powerful, can have no value after its meaning has been taken away. The design of the cross top, was made to look like an ordinary fashion top, but with an unknowing religious undertone to it. When the top is worn, a crucifix becomes exposed on the back so that the person wearing the top cannot see the crucifix, but others can. This reflects the idea of perception- to show how people wearing the cross can sometimes be unaware of the subjectivity surrounding the fashion cross when it is worn as a trend. “I’m exhibiting two different series. The first is called ‘I know a young lady who swallowed a fly…’. It’s a set of eight images and they’ve been influenced by insects. We’ve got moths and jewelled caterpillars and they’re all reflected in the clothing. I wanted to make something that was not about the person but more visually interesting as an image. The second is from an editorial portrait series. It’s kind-of got an intrepid explorer feel and the backdrops were made by hand and it was shot in natural light in the studio. It was a lot of work! We went to the skip three times to get paints, I broke my car once and had to get it towed. I shot old Polaroids that were eight years old and they form different colours. All of the backdrops were painted copies of Polaroids that I’ve shot. “I have two piece of work up at the exhibition. One is based around identity and I looked at how hair is important to someone’s identity and how it’s so important to religion. I looked at different races, different people and different hair. I managed to photography a girl who unfortunately lost her hair through alopecia and a long-haired Indian guy who’s got hair down to his hips. It’s a progression between how important hair is to your identity. That was a portrait series but I’m predominantly a fashion photographer. This series is loosely based around The Virgin Suicides, the film, and bringing in more of my style which is based on natural light and pastel tones. Before I started the course I was assisting a celebrity portrait photographer and shot with flash, but since the course has gone on I’ve shot with a tripod and natural light. “I knew for this project that I wanted to go abroad to shoot it. I was looking around online for volunteering opportunities and I found this place. It’s called the Kathputli colony and it’s the world’s largest concentration of street performers who all live in a slum in Delhi. In exchange for teaching English and basic admin work, I got two guides to take me around the slum for a month and introduce me to all of these people. Kathputli is actually Indian for puppet, so it’s literally the puppet colony. "It's been really, really good to respond to something different, that's a bit rough and raw." Bethany Bailey — Teeth Cut, But Have You Washed Your Hands? “My work is about finding subtleties in spaces. Here, I’ve worked to use a space and the surroundings. I’ve drawn directly onto the ground, responding to the light that’s moved through the window and responding to the time passing. It’s all about drawing in my practice, and this reflects in the prints on the walls as well. These are blind embossings that use the etching process to create them. Instead of using ink, I use a dusting of French Chalk that picks up on the paper. So they’re very, very subtle and you have to be at a subtle angle to see them. It’s really nice to be in this kind-of space [The Truman Brewery]. It’s been really, really good to respond to something different, that’s a bit rough and raw. For me, it’s been very, very useful to work in a space like this. Bethany Bailey at Teeth Cut, But Have You Washed Your Hands? Bethany Bailey's work at Teeth Cut, But Have You Washed Your Hands? "For me, Wilfred was playing with the acoustics of the space and I was intrigued to see how it would fool people." Dan Broadbent — Teeth Cut, But Have You Washed Your Hands? “For this exhibition, I’ve submitted a piece of work that is basically a documentation of an installation that my friend Wilfred and myself took part in. Wilfred is an Architecture student and we worked together about six months ago. We were playing around with binaural sound, which is recording right and left individually, and we played around with how that can play with people’s perceptions a bit. We took a replica foam head and placed it on a chair and recorded the sounds and enacted a performance with the objects in a room. The next day, we placed people in the exact same room, with the exact same objects, and played what we’d recorded through headphones, but they were blindfolded. When they took their blindfolds off, everything was supposed to appear as though it had moved, but everything was as it was. Dan is the AUB Students’ Union President elect. Dan Broadbent's 'Sound Experiment' at Teeth Cut, But Have You Washed Your Hands? Dan Broadbent at Teeth Cut, But Have You Washed Your Hands? "The course really allows you to explore a lot, and pushes you to, which has led me to doing video projection…which is really different to painting!" Sophie Newton — Teeth Cut, But Have You Washed Your Hands? “I started off doing performance-based work, which then turned into video projection work. I always film groups of people doing a performance of action. It’s about social interaction, the individual and the unit and the differences or similarities between that. I like to film from above, so you get interesting shapes and patterns emerging from that. With this I doubled the videos and had them looping, so those individual actions happening in each cell then form a bigger thing happening! Sophie Newton at Teeth Cut, But Have You Washed Your Hands? Sophie Newton's work at Teeth Cut, But Have You Washed Your Hands? “My project is looking at an incident that my grandfather was involved in, in 1945, it’s The Yangtze Incident. The main story has been heavily publicised but there’s one strand that’s never been told — that’s my grandad’s story. He got thrown overboard with 49 other men — they had no idea where they were going, had to trek through minefields, two guys got taken as Prisoners of War, and they eventually made their way to Shanghai, to safety. I took his memoir and I wanted to relay the emotions and fear that he felt in architecture, just to get the story across about how horrific it was and the fact that these men need recognition. I took the shape of the ship — the HMS Amethyst — I blew it up, to create a shrapnel concept and put the shapes back together, designed in 5mm steel sheets. I put the shapes back together in geodesic and geometric shapes. Each single sheet was specifically played to relay a fear or feeling or emotion that he had written in a letter for me. Some of them get tighter where there’s fear in the story, some are really open because it’s a sense of adventure, the minefield is all jagged. It stands as an exhibition and as a memorial. Because this is such a raw structure and the story is heavy going, I decided to create a child’s activity to make it more family friendly. I created a silhouette of Simon the cat, who is one of the most famous members of the crew because he got a Dickin medal, which is the highest award an animal can get. The children are told at the begin that they have to go and find Simon and right round the end before you exit, there’s a huge bit where children can climb up and about. It just gives it a softer edge. Find out more about Rebecca’s project and follow its future on her blog. “This is a transformational living space for my client, Joanne O’Riordan. She was born without all of her limbs, so this project is aiming to provide her with the independence that she desires, so that she can live without a carer (without her Mum). This space allows her to live on her own, use all of the different appliances in her domestic space. Carl’s project received a nod of approval from Volkswagen. My project was on St. Mark’s School. It’s a listed school in Bournemouth, more or less opposite the AUB campus. It’s 150 years old and they have really progressive teaching methods and access to advanced technology, but their classrooms are quite Victorian. Although they have interactive whiteboards instead of a blackboard, it’s still quite a traditional setup, so I looked to teaching methods and learning styles and how children learn and develop. I developed learning environments that are more open and have different environments that are better suited to kinaesthetic learners, visual learners, logical learners, auditory learners. When they enter the lower part of the school, in this area they discover what kind of learner they are by experiencing each type and they can feel more comfortable in their best environment. By the time they reach the upper area of the school, it’s much more open and they can be given and know the best place to go to do that. You can find out more about the process behind Hannah’s project over on her website. “I designed two pavilions for locations in a forest and in a town. The idea was to bring people from the city into the forest and bring more attention to how important the forests are. Wood is everything — you look at all the designs of structures, houses — it’s everywhere. It’s such a beautiful material, so I wanted to highlight how important it is and how we need to keep our forests intact. The forest pavilion is designed to reflect the shape of buildings and it’s almost Cathedral-like. The idea was to guide your eyes upwards so you see the forest and the trees, rather than just the bit that’s at eye level. In the town, I wanted to make something that’s kind of representative of the forest but also cityscape-like as well, so it’s a bit of both to try and connect the two. When you walk around it, it distorts your view so you can only see different parts of it, so again it forces you to look at different heights and different surroundings. I think I’ve become a bit more experimental. I’ve enjoyed this project a lot more because it’s all under our control. I just looked at all the materials and wood is something I really liked and have a passion for. “The project combines my passion of football and design, showcasing the many layers of under-represented fan characteristics (through a print publication) that may previously be deemed irrelevant or minimal, and reflecting fans in a positive and educational tone as ‘true fans’, contradictory to negative media commentary of hooliganism, for an audience with little understanding and relevance to the sport. AUB has been an outstanding place to learn and develop, working in a creative environment whereby every individual has a part to play in assisting one another to improve a wealth of vital skills, perfectly preparing myself for industry. It has been an honour and a privilege to represent and be part of Visual Communication, and through the guidance of knowledgable lecturers and visiting tutors, has led to awards and nominations I could have never imagined at the start of the course. “I never thought I’d be learning how to sew let alone creating a set of umbrellas for my Final Major project, but that’s what is great about Graphic Design at AUB. The most valuable thing I think I have learnt there is to not be confined to the four corners of a piece of paper, to let ideas drive your creativity and dictate the media and canvas for the outcome, no matter how big or small or even outrageous it may seem at first. The focus of my Final major project was the predominant rise of modern surveillance in Britain and consisted of multiple visual outcomes. More specifically my set of ‘Privacy Umbrellas’ was my response to the overwhelming number of CCTV cameras in Britain and collectively they address the ethical issue of ‘choice’ in regards to surveillance. The idea started off like most, very simple, with a basic observation that the structure of an umbrella acts as a shield from CCTV cameras that more than often are mounted up high. Chris’ work was featured in Creative Review’s best of D&AD New Blood 2014. “This investigation graphically represents imperfections by intentionally subverting objects. The Imperfect Campaign intends to make social statements in an unconventional way by making the viewer question their attitude towards them. The idea came from me delving into the broad subject of imperfections. I didn’t wish to focus on body image as this is a prominent issue in todays society. It developed by looking into the perfection of social media and subverting the angle in which we perceive it. My inspiration for this project came from looking into body image. During my initial research it was obvious that there were bigger issues that could be addressed within this concept. I overcame this by stepping out of my comfort zone and thinking a little more conceptually. “My project is called By Hand. It’s an exploratory project that, over six months, looks at how creativity is used within the industry and how, by hand, you can create something magical that still makes people stop and go, “wow”. So I looked at old techniques like relief printing and foil-blocking and how they converge with new technology. The quote that I picked out — “I can’t quite make it out but it looks cool” — is the fundamental of people who are narrow-minded about design who might say “oh you just draw” or “you take photos”, but we do so much more than that. We create something that people want to do and by hand, so I wanted to show that off. “The brief was to create an app for any domestic target audience of your choice to save energy. The process we went through was quite long. We started figuring out where npower can save the most energy in terms of people who use apps and use the most energy. The app tracks who’s in and who’s out and turns energy on and off accordingly. It was really interesting to get into the target audience’s mindset. We had a couple of focus groups asking people in a house share, “What is your problem when trying to save energy?” and there’s a classic scenario where one housemate will turn up the heating and the other will turn it up. This addressed it because each housemate can set their personal preference and depending on who’s in or out the app will create a happy medium. We’re just waiting for Thursday now to see if we get an award from it because it’s been nominated. AUB I think is really, really nice. It’s a creative institute by itself. It’s been really cool to get involved with other courses and the whole creative community. Find out more about Synergy and watch the video on the D&AD New Blood website. “It’s all about Testicular Cancer awareness. I want to get into advertising and art direction so I started out trying to make it a bit funny as well. I started off thinking about how to get men to go to the doctors. I picked sports and balls and it all went from there. “It’s a book split into two halves. This side is all about conspiracy theories, “Is Bigfoot real?”, “We’ve seen him”, eyewitness evidence, newspaper clippings, abductions, everything like that. On the flip side, it’s the scientific approach. This is more considered with diagrams, “these are the reasons he doesn’t exist”, everything like that. In the centre, there’s newspapers and the reason they’re in the centre is because they could be used for either argument. So scientists could say, “look what the tabloids are printing, it’s a load of rubbish”, or the conspiracy side could say, “it’s a newspaper, why aren’t you taking notice of this?”. It’s a lot of fun to work on. I started thinking, “oh this will be so funny” and when I started to research it I realised that it was really compelling. The answer is that we’ll never know if he exists or not because there’s so much of the world that’s yet to be explored. Sam’s Sasquatch Analysis book was recognised by the International Society of Typographic Design and presented with a 2014 Student Award. “My work is about the internet and technology and how information is broken up — it’s spread across different webpages and different mediums. When you’re searching for something, you have to look in a lot of different places. What I created was a book that works alongside an iPad app. You read the book and next to the text, there’s a little symbol and that links you into the app where you’d find more information. It’s breaking things up and it’s kind-of inconvenient, but it’s making a point that it is what’s going on now. It was a long and tiring project! “I was looking at memory to start with and then, from memory, started looking at dementia. It’s quite an interesting subject that a lot of people don’t know anything about — I didn’t know anything about it — but it was through talking to different people whose relatives have dementia that I then started collecting loads of quotes and asking questions. “All of my projects are nostalgic, so the things that make people remember a certain point in their life. This particular project was about one of the biggest things I think everyone has a memory of at some point in their life, which is going on holiday. It’s a lot of trial and error — the suitcase, for example, took about six days to put together. I generally work with paper and card and that had to be more solid, so that had to be made out of cardboard, which is something that I’ve never used before. “[This is] a selection of different bits of work I’ve done throughout the year. I love anything cluttered and a bit rubbish and trinkets and bits like that. Basically, it’s just creating lots of rubbish — nice-looking rubbish! Each piece took me about a day to make, in my tiny little uni room with a sewing machine at 3 o’clock in the morning, frantically trying to get it all done, covered in thread! “I do children’s picture book illustration. The Peter Pan one is kind-of self-explanatory! I was just watching it and decided I wanted to do my own version. I just love creating characters and little worlds — this is what I love to do. In my first year, I loved drawing but I didn’t know where my work was aimed at and I just loved children’s picture books anyway, so I thought I may as well have a go and I’ve been getting better and better so I’m just carrying on with it, really. It’s definitely what I want to be doing in the future. “A lot of my work focuses around buildings as opposed to people. My dad’s an architect, so it’s probably where the love of buildings came from. I quite like getting the character of a building as opposed to that of a person. For my final major project, I wanted to a lot of screen-printing, so I did a book so I could do a lot of screen prints of images from within it. I really, really enjoy it and it’s something I want to do a lot more of. Before I started on Illustration, I was thinking of doing modelmaking, hence the model of the buildings. It’s also probably why I love screen-printing, because it’s quite physical. “I was looking at 1950s culture and I’ve always loved stories where nothing really happens. I’ve always loved the atmosphere and building a tension. It’s sort-of Mad Men inspired. The story is simple — the bloke’s coming back from work and the woman’s got her place in the home. It’s making the point that roles now are very different. I draw out a simple storyboard but the frames are very much dependent on what I have in terms of material — there’s a lot of Ideal Home magazines from the 60s and 70s and a lot of film magazines, advertising films in the cinema from the 50s. The frames develop from what I actually have and I piece it together from what’s in front of me. The BA (Hons) Visual Communication at the Arts University Bournemouth is proud to present our most fridgeworthy pieces; a collection of our unique talents and work to suit any appetite. Collaboration is at the heart of what we do. Here are two of our final year Illustration students working together to bring out the best in each others mediums. Marianna Madriz draws beautiful characters and Abby Foord works in paper engineering – this is what they created together. “I like to think of my illustration work as a mixture of everything I admire visually: playful characters, striking colours, shapes and patterns. It’s inspired by Latin American folk art, fashion, 1950’s design and anything surrounding me that I find interesting, and I feel my final book for university reflects this to some extent. After the summer shows I want to keep creating and getting better, learning to develop good story lines and experiment with sequential illustration. I’m hoping to create more self published zines and narratives, as this is mainly the route I want to take with my work. Molly has designed the BA (Hons) Costume 2014 Graduate Exhibition. “I felt very strongly about wanting to take on this project because it’s the kind of job I aspire to have in the future, but one that often requires years of experience, so the chance to have a go now seemed like a fantastic opportunity to get a big exhibition project under my belt just as I’m graduating. Also, to see how it compares to set design. Going to exhibitions has always been exciting for me, so a big part of the research was visiting museums and current exhibitions. I found lots of inspiration in the way information and exhibits were displayed so individually – to suit the nature of the work or art. Three big ones to mention are David Bowie Is… at The V&A, Isabella Blow: Fashion Galore! at Somerset House and Hello My Name is Paul Smith at the Design Museum. They varied in scale and style and demonstrated how space can be used to guide a visitor in a certain way, or let them make their own decisions: creating a narrative. Having gathered lots of images and ideas from current and past exhibitions I started considering how to display my peers’ work. There is such an incredible range of style and type of work on this course, that it seemed pointless to attempt to theme or group the exhibits and what would be important is to allow them to speak for themselves by providing the appropriate environment. To show off the range of disciplines studied on the course I have specifically linked each exhibit to a colour, which refers back to construction, design, supervision or film. This provides a physical guide for visitors to follow, in the form of a pathway on the floor. The difficult part of having a clear image of what I wanted it to be like in my head, was communicating this and then facing the realities of the design. Mainly being, that there is not enough space for the sheer volume of work. The challenge is then to rearrange and focus on the layout as a natural occurring part of the exhibition, rather than a cumbersome afterthought – something quite apparent once you’re walking around. To hope that the design can be finalised and nothing changed after a certain point is simply unrealistic, as adjustments will be made right up until the last minute – but that’s ok! As with set design, I’m expecting my favourite part to come when the build begins to happen and everything starts shaping up right in front of you, by then it’s far too late to worry. “These are my product mashups. I’ve taken the design language of a chainsaw and a sewing machine, and swapped them over so it changes your perception of how well they would function. You’ve got the feminine elements of the sewing machine design contrasting with the ‘manliness’ of the chainsaw. The sewing machine looks like it could sew through bark! In the International Journal of Design I saw a Swedish group who explored this idea of gender norms with a hand drill and a hand blender. "I wasn’t keen on the way that Marvel has made Groot, so I decided to design my own version of him..."
“I saw the trailer for Guardians of the Galaxy at Christmas time. I wasn’t keen on the way that Marvel has made Groot, so I decided to do my own version of him. It started out as a clay sculpt. I then cut him into bits and had 6 pieces in silicon block. It went through quite a lot of silicon! The limbs and the head are cast and fast cast and the torso is fibreglass because it weighed something like 5 kilos in clay. Fibreglass was a better option because it’s just as strong and its hollow. The legs and arms were then bolted on. It wasn’t until it got the paint on that it started to come to life, because the fibreglass is black. When I got the primer on I started to really see it happen. "Mulch is a big furry mountain monster, who sleeps in caves by day and forages in the woods by night…"
Welcome to Project Mulch. Mulch is a big furry monster, designed and created by Lorna Moon, Ciara McClean and Freddy Holdsworth at AUB Modelmaking. “Mulch started out as an idea in our second year. We went to visit John Nolan who specialsies in Animatronics. We saw his work and got really excited about it. Ciara did all the character design and it spiralled from there. The face is all radio controlled and the suit itself is controlled by the person wearing it. He has his own beer as well – we are working on getting the beer into production. We’d like to make a promotional advert for it, featuring Mulch. Our tutors kept calling him munch and we got it wrong and called him mulch – we liked that better, it suits him. Its earthy. “This is a recreation of a prop from American comedy Parks and Recreation, which I’m a big fan of. Its bronze powder, fast cast, sculpting and laser cutting. I also made a puzzle maze on the lathe and mill. I got it sulphuric anodised to protect the surface – it gives it the blue colour. My stained glass butterfly is based on a glasswinged butterfly. Their wings are actually see-though, so I choose to use glass. I sculpted the body and cast it in pewter. This model is ten times bigger than the real thing. “My work explores the versatility of knitting as a drawing tool whilst trying to challenge stereotypes that surround the process of knit. “The whale was initially a client project, and they wanted two fins. I really enjoyed making that for them, so I made this version of which has more of a natural history feel and only has 1 fin – which they do in real life. The dragon head and claws are part of a puppet.The body is articulated and can move, and then I fabricated over in it black and I sewed individual scales on. “New Blades has been great. It’s one of the first time you see you work on display, not in the corner of a messy desk. I made the bird, dog and sausage head for the Acting production of Grimm Tales. I had to make the bird pretty quickly in 2 weeks. I’d worked at a company called Rainbow which makes mascots, so I’d picked up everything I could. Watching the show was cool, seeing your work used in a live situation makes it all worth it. “All my work is designed for retail. I wanted to create quirky pieces that would draw people in. The lips made of lipstick would be used to display shades of red for a brand. It has been created using Rhino to lay out the lipsticks evenly, then the base is laser cut black acrylic attached to painted black MDF for strength. The lipstick head was lathed from cemi wood, and then repeated with a silicone mold. Each lipstick head has been made from fast cast, and pigmented accordingly. “These are a pair of shoes inspired by Kandinsky. I’d like to work in footwear, but come at it from an architectural angle. These aren’t wearable, I’ve put them on but wouldn’t walk in them! I am more interested in sculptural and exhibition pieces. I made friends with a furniture maker over the summer and she does a lot of laminating work. This inspired to me try and use as many techniques as possible in this project. I’ve wanted to work with leather for a long time. This was a 5 week project – the finale! I also created a pair of 17th century replica shoes for an exhibition in Bournemouth for the BU Archaeology department. They’ve been bringing up pieces from the Swash wreck in the Channel and they found an old shoe, so I created them a replica. They were tough to make as everything is hand sewn. It was great to collaborate on that project with a guy who makes them professionally on the Isle of Wight. He lent me the ‘Lasts’ which are the wooden blocks you make the shoes on. “These are cosmosis fits – which basically replace a missing artificial limb. I wanted to find a cheaper way of customising prosthetics for kids at a younger age. I wanted to show them that its ok to be different, and that they can be proud of a missing limb. I found a way to lasercut sheeted silicone – I spent hours playing with settings. I was told it might not be possible but I wasn’t taking no for an answer! I mixed my own silicone and had It sheeted and then lasercut unique sheets and then inlaid them to the feet. They don’t have to use these all the time – you can swap them over, so you can use these if you are going on a night out or to the school disco. At the moment, all you can have with a prosthetic is the tattoo painted onto it, and it takes a trained technician to do that. Also the ink sits on the surface, so friction can rub it off. This way the ink is totally inlaid so it wont rub out. I’ve done one for Jackie Coventry, and she is the first person in the UK to have a laser etched tattoo. It’s her gym leg – she now she loves going to the gym and showing it off! BA (Hons) Graphic Design are busy creating Engage. BA (Hons) Costume with Performance Design have started to build their Summer Show, taking over the Studio Theatre. The giant puppets from ‘Oh What A Lovely War’ are suspended from the ceiling, and the mannequins are waiting to be dressed! “My project is looking at how the combination of traditional print methods and modern technology converges to celebrate the value of craft. By understanding traditional print methods, it has allowed me to create a set of typographic illustrations, following the process through to a final series of hand crafted prints. My main inspiration is taken from a passion of hand rendered typography and the current design industry. “My final major project was a set commission for dance circus fusion company Joli Vyann. I worked in collaboration for this project with Natalia Maslanka, another final year student from Interior Architecture and Design. “I enjoy creating tactile works, which explores the dis-location of culture. Primarily working with human hair, using this medium for creating tactile objects which reference ethnicity and cultural differences. Through my work I aims to give a unique insight into this issue, which is outside of our daily understanding and experiences. “The subject of this project is exotic birds and reptiles in their natural context amongst tropical flowers, plants and foliage. The inspiration and interpretation behind the imagery is derived from nature, museums, botanical gardens and wildlife parks. The objective was to translate the natural beauty of wildlife and nature into interior designs for wallpapers and fabrics. The target market is boutique hotels. I focused on specialist screen and digital printing, using a range of hand print techniques; pigment, procion discharge, foil and flock. These techniques were used to work back into the digital fabric prints, alongside the screen printed fabrics. Drawing was vital to the design process, using first hand research and photography. Traditional drawing techniques and designing with Photoshop CS6. Which enabled me to put my drawings into repeats for digital prints and wallpaper designs. They were styled with the intention of complimenting both contemporary and traditional interiors. “For my final collection at AUB, I created series of avant-garde yet playful fashion accessory and embellishment pieces. For these works I was inspired by the subtleties of repeat, order, overlay, linking and connecting that are present in Brutalist architecture; juxtaposed to the textures and patterns that encroach on these buildings like the growth of moss and peeling paints or drain covers and paving stones. “Refraction displays both print and manipulation techniques creating a unique collection for womenswear fabrics and accessories. Taking inspiration from refracted imagery within everyday – looking at distorted forms in reflective surfaces along with digital malfunctions such as static and glitches. I have used print techniques to create bold and colourful designs for garment and accessory fabrics. These printed fabrics are often reworked using folding techniques taking the form of geometric tessellations representing the refracted images viewed within window shapes of reflective architecture. These pieces are intended for accessory ideas focusing on bag panels. 2D folds also becomes 3D using bonding techniques to fuse components together and create expanding, movable pieces for bags/hand held accessories. These are interactive pieces whereby the piece has to be manipulated in some way to see its full form. These ideas are to be developed in terms of materials, structure etc. 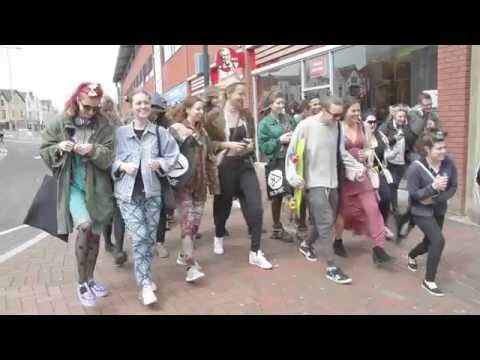 “Press Play was a mass participation event, in which a crowd gathered at the Triangle in Bournemouth Town Centre to listen to the same MP3 at the same time. Participants listened to an MP3 that instructed them to take part in activities such as high fiving strangers, attaching pegs with compliments to unsuspecting members of the public, and taking part in a dance off. The track took them on a journey through town and down to the seafront. In preparation for this event, we built up a brand with a strong following. Nudge’s aim was to create humorous happenings in public spaces. Our most successful publicity stunt was on Valentine’s Day when an actor and violinist travelled around university handing roses to girls and serenading them. We also organised guerrilla marketing campaigns to publicise our brand and Press Play. The purpose of Nudge was that there is no purpose. We wanted fun things to happen for no reason and for people to ‘play’ again, like they did as children. Vision: To recreate the element of play within society. Mission: We aim to create shared experiences in Bournemouth by staging a series of innovate and humorous happenings in public spaces. “My inspiration for The Inexplicable Cabaret Circus, a show and dining experience, came from a combination of different shows and events I had seen or been part of in my past three years at University. Through volunteering at Pavilion Dance I was able to see a lot of their performances. Through awe I was inspired to hold an event that was very performance based. The 1930’s Circus, Cirque du Soleil and swing cabaret where also all huge influences. I really wanted to create something different for Bournemouth that was fun and incorporated dining and a show, a perfect combination. It was also important that we used a unique space to set this show in so finding a church that had never been used before for the event was literally perfect. Church meets Circus! “My German puppet Moltke character was a fun one to play. Based on General Moltke, he was the Kaiser’s ‘lunatic attendant’, so making him as hysterical and evil as possible was great fun, and learning to walk and act inside those huge puppets was a challenging feat! Teeth Cut, but have you washed your hands? BA (Hons) Fine Art are building their final show – and you can watch it all happen on their blog. Teeth Cut, but have you washed your hands? will be at Brick Lane in London, 3rd- 7th July 2014 at Free Range. BA (Hons) Fine Art are building their final show – and you can watch it all happen on their blog. Teeth Cut, but have you washed your hands? will be at Brick Lane in London, 3rd- 7th July 2014 at Free Range. Volkswagen have offered an endorsement of the final major project of Level 6 student Carl Williams, who designed a robotic home for a young woman suffering from tetra-amelia syndrome. Carl said: ‘The aim of the project was to provide Independence for a severely disabled person, born without all of her limbs. Her name is Joanne O’Riordan. Using futuristic but realistic technologies, Joanne’s living space is transformed around her to allow her to function with complete independence. Volkswagen Press and PR: “Volkswagen believes that good design is essential for progress. Design should have a purpose and move the game forward. In combination with good technology and engineering and by working in partnership from the conception to the execution of a product the best results can be achieved. We need to train the designers and engineers for the future and hence it is important that university courses offer the high quality tuition which helps produce the designers of tomorrow. 77 year old Jean Woods and David Grant modelled some of the AUB collections at Graduate Fashion Week to thunderous applause. AUB Fashion works with ‘All walks beyond the catwalk‘ whose aim is to empower the next generation of creatives, from design, film, photography and journalism to create a fashion future that promotes a broader range of body and beauty ideals to truly celebrate individuality. 77 year old Jean Woods and David Gant modelled some of the AUB collections at Graduate Fashion Week to thunderous applause. Founder of ‘All Walks’ Caryn Franklin introduced the AUB Graduate Fashion Week catwalk – praising the consistent involvement of BA (Hons) Fashion and dedication to the ethos of ‘All Walks’ from the students. “These bikinis are designed for the Fashion conscious surfer. They are an alternative to the spring suits that are available on the high street. There are currently not many functional and agile bikinis like this. They’re for all sizes, look great on, are skintight and really supportive. “Having my work chosen for the GFW catwalk was so unexpected. I’m so happy with how it looked up there. I knew I wanted to use denim for my collection so I took my inspiration from denim itself – I used a lot of dying and bleaching techniques. From there I looked at Jackie Nickerson and a project about a Nigerian tribe who reused their clothes to make new outfits. “I was so please with the GFW show – it went as smoothly as it could! My work looked at two realms – the spiritual and the physical, and the battle between the two as the two elements struggle against each other. Some elements of my collections represented the spirit and some the flesh. Knitwear and texture is a huge part of my work and I have experimented with wool, leathers and plastics. I cant believe my time at AUB is ending, its been so great and the time has flown by! “Seeing your work in London on the catwalk was an incredible experience. My collection took inspiration from an exhibition in the AUB Gallery: Block Party – Contemporary craft inspired by the Art of the Tailor. I saw a piece there by Rhian Solomon on Body Cloth. It questioned if we can we cut cloth in the same way we cut skin. I have a family member who is a surgeon, so I have looked at reconstructive plastic surgery and cutting methods, and used them within fabric. “Graduate Fashion week has been really exciting – talking about your work with the industry is brilliant. Winning the Fashion styling and Creative direction award has been a joy! My final collection comprises Millinery, styling and creative direction. I’ve used three concepts: Africa in 1889, Bollywood vs Burning Man and Chinese propaganda from outer space. I wanted to create prints that showed these genres and shapes that exaggerated the cultural refernces and imagery that melted perceptions of styling. “The GFW show was amazing – I’m really proud of my coursemates! My prints in my collection are based around my Fathers artwork. I’ve been surrounded by it from such a young age, from my 2nd year at AUB I knew that I was going to do this project.There’s a transatlantic relationship in my work – the traditions of Savile Row meeting the vibrance of New York cityscapes. Lizzie has a strong individual design style. Her fusing of traditional and conceptual design recently won her the ‘Savile Row Training Academies’ Bladen award. “My collection comes from a childhood love for all things spooky. It emulates that feeling of wanting to dress up as a character and have fun with your clothes at that age. I always wanted to be a vampire instead of a princess, so have used wolves, bats and ravens in my designs. I’ve loved my time at AUB. Its been challenging doing childrenswear but so rewarding because it makes you it really makes you work for what you want to do. My organisational skills are now through the roof after organising the models! “I started researching about what exactly architecture means for people and I found this exhibition, which was called “Sensing Spaces: Architecture Reimagined”, which inspired me to create a public space, that would draw people and enable them to enjoy and connect with it. Hence, I came up with an idea to create a sustainable “solar bus stop”. I realised how many people use public transport nowadays and after many centuries people will still use it. So I decide to improve it and create a place, where people could find it flexible to use. I also looked up architecture and art works. I found a couple inspired books, about small design with big ideas. I was incredibly inspired how many small designs can be complex, but at the same time quite simple. I also found out about “Jinhua Architecture Park”, which inspired me the most. “I have loved working at the Arts Uni, because they always gave me the freedom to do what interested me. “Having lived in Africa all my life, I realise the need for professionals with specific skills in the field of the built environment, interior design and interior architecture. For example to create infrastructure and housing that is sustainable, affordable and aesthetically pleasing. “The aim of my project was to tell a story through a garment inspired by social and political issues in Cambodia as well as the Khmer architecture. “My work aims to explore and comment upon misunderstandings in language through interactive design. I produced a conceptual graphic art piece that studies a variety of aspects encompassing this concept: from technology’s impact on communication, to punctuation and concealed messages, provoking the audience to read between the lines. “My project is on “Identity”. After exploring range of perspectives on the topic, the work conveys my opinion towards it. It is made out of many different colours and sizes of human shaped keys, lasercut and arranged in a circular format, presenting many unique individuals in the world. The key figures shows the idea of ‘you create your own life’ as possessing a key for the door lock means you are in control of locking and unlocking the door; the door as the metaphor for new life and opportunity. The use of generic human figure presents people of the world. The idea of creating one’s own life is similar to the idea of existentialism but in a positive way. I was inspired by portraiture works of Cindy Sherman and Nikki S. Lee, where they presented themselves in many different characters. Combined with other researches such as narcissism and individualism, I thought that each person is capable of controlling their life. “During this final major project I have challenged myself to explore questions that examine aspects of man: humanity, what it is to be human and the ever-developing relationship between man, science, religion and technology, to consider where our boundaries lie. Through a vast body of scientific research, artists, articles, film and novels that underpin my work, I came to realise the fictional ideas of a future where man and robot live together are no longer a distant fantasy, but increasingly becoming a reality. This lead me to question, how far will we go to creating new, improved versions of ourselves? Although these question seem daunting and frankly terrifying, they have drawn me closer to understanding the incredible complexity of the human form; our capabilities, emotions, ideas, dreams – aspects that can never be recreated. I intended to experimented with a vast range of materials and found means to exhibit these experiments. The cycle begins central, at the top with the symbol of the mother, mother earth. Clockwise each individual box reveals a different aspect of man and the relationships between the natural and the industrial, energy and electricity, presenting the time line of each up to the current day. It ends without answers but presents the fingertips of man and robot almost touching, almost connecting, almost one. There are many underlying concepts to my piece that touch on all aspects of humanity, a reflection of society today. I aimed to ask questions, make others questions and take a moment to embrace our culture, human desires and ideas of progress, yet retain a sense of forewarning. Taking great inspiration from Mary Shelley’s novel ‘Frankenstein’ my piece is riddled with quotes that explore the difficulties and problems of creating life through scientific discovery and technological advancements.